The 2015 MotoGP™ World Champion continued his championship form, a second clear of the rest of the field as 2016 got underway. Sepang hosted the first test of 2016 as 21 riders took to the track for the first time since November. The post-race Valencia test gave riders and fans a glimpse at what was to come, but Sepang was the first time that all riders took to the track with the spec ECU and Michelin tyres fitted together. 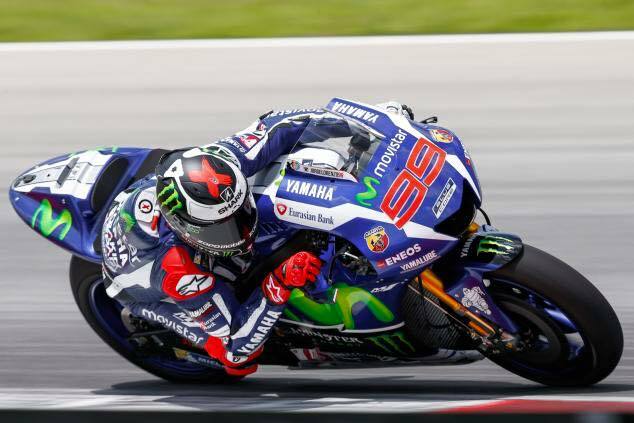 Despite the unknowns, Movistar Yamaha MotoGP’s Jorge Lorenzo continued where he left off in 2015 as he dominated the field. A 2’00.684 set the Majorcan over a second clear of his closest rival, Movistar Yamaha MotoGP teammate Valentino Rossi in second. Lorenzo’s lap was only 0.078s slower than his fastest lap of the race in 2015; with new tyres and new electronics this is a positive start for the five-time World Champion. Just behind, Rossi completed an incredible 55 laps, his 2’01.717 coming on his 52nd lap. Rain had been predicted to fall earlier in the test, but held off until the final 20 minutes which allowed riders to maximise their time on track. It was not just a single flying lap from Lorenzo, the factory Yamaha rider completing seven laps under the 2’02 mark, with three being 2’00s. Lorenzo fastest lap was his 32nd of 37. 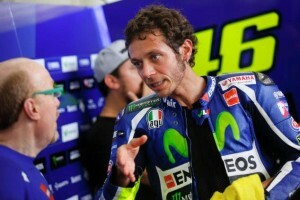 Meanwhile Rossi set just a single 2’01 lap, but did manage 12 laps inside the 2’02s. Completing the top three was Dani Pedrosa, the Repsol Honda rider continuing to assess two engine specifications. Throughout 2015 Honda riders struggled with an overly aggressive engine, resolving this issue is Honda’s primary aim for the three day Sepang test. Fourth was Danilo Petrucci, 1.127s shy of Lorenzo’s best time and 0.101s ahead of factory rider Andrea Iannone. Petrucci, along with Scott Redding, will race the GP15 in 2016. Iannone spent the majority of Monday on the GP15, debuting the new 2016 Ducati later in the day. Hector Barbera made it three Ducati machines in the top six as the 2015 Open Champion put his Avintia Ducati GP14.2 in sixth. Behind him was fellow Spaniard Marc Marquez, who set a 2’02.278 and was over 1.5 seconds behind Lorenzo. Scott Redding, Aleix Espargaro and Cal Crutchlow rounded out the top ten and were all within two seconds of Lorenzo. Despite the top ten, it was not a perfect day for the Team Suzuki Ecstar rider who suffered an engine failure. Fortunately this was on his 2015 machine and his new bike with the seamless shift gearbox was unharmed. MotoGP™ Rookie of the Year, Maverick Viñales, was 11th and 0.001s faster than Monster Yamaha Tech 3’s Pol Espargaro. Both Espargaro and Bradley Smith were on the 2015 spec Yamaha, similar to what Rossi and Lorenzo raced. Smith suffered a small crash at Turn 15 but was unhurt, ending the day in 15th. The Valencia test saw a high number of front end crashes, no such issues appearing in Sepang. Andrea Dovizioso was down in 13th as he spent a majority of his day on the GP15, completing 40 laps. Behind the factory rider was Aspar MotoGP Team’s Yonny Hernandez, the Colombian adapting to the new Michelin tyres. It was an unfortunate end to the test for his teammate Eugene Laverty who fell at Turn 4 and suffered a broken right wrist, ruling him out of the test. 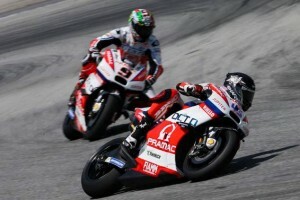 Michele Pirro ended the day 16, the Ducati test rider having already ridden on Saturday and Sunday. Meanwhile Loris Baz celebrated his 23rd birthday with a 17th place finish, competing 58 laps, just one less than teammate Barbera. With 53 laps, Tito Rabat continued to adapt to life in the premier class. As teammate Jack Miller is out injured, the Estrella Galicia 0,0 Marc VDS team focused all of their attention on the Spaniard. Stefan Bradl and Alvaro Bautista rounded out the 21 riders, the Aprilia pair on a lab bike as the reveal of the new 2016 model was pushed back. It was also announced that Casey Stoner will join the MotoGP™ riders on track on Tuesday, Stoner participating in his first official timed session since Valencia in 2012. Coverage again begins at 10am Local Time and lasts eight hours.